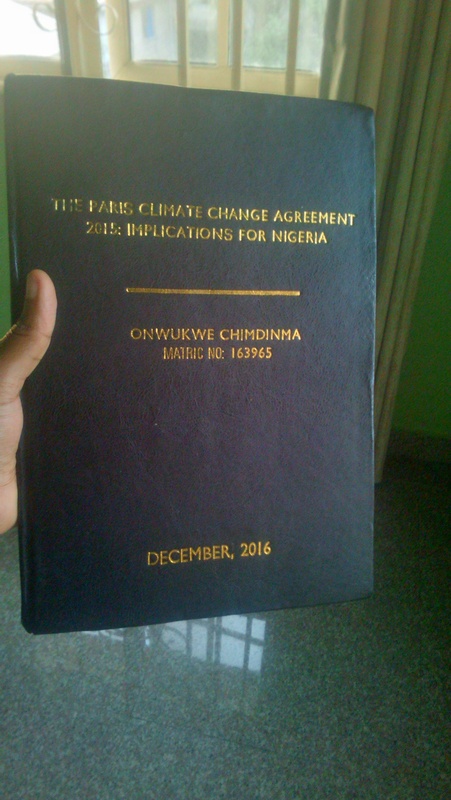 THE PARIS CLIMATE CHANGE AGREEMENT 2015: IMPLICATIONS FOR NIGERIA. I am interested in a lot of legal things. Litigation isn’t one of them. I believe there is so much one can do with a law degree. This rigid litigation goal is quite choking. I am fascinated with International law, Energy and Environmental law and a little bit of Taxation and Revenue. I think there is so much that we can do in those regards. Picking a topic for my project was quite stressful. I thought about a lot of things and asked senior friends for help. Then one evening, I was in the sitting room watching the evening news and VIOLA! The inspiration to write about the Paris Climate Change Agreement came. With the help of a lecturer and a supervisor I was able to coin out the perfect topic. I have always loved Environmental law. Growing up, my dad had these video cassettes of the animal world and planet. He would make us watch and tell us intersting stories. Sometimes, my dad would go outside and just gaze at the stars. “God is beautiful” he would say. So I guess it was natural for me to waltz in and register for Environmental law as an elective in my 400level. I would go on to become the VICE PRESIDENT OF THE CLEAN EARTH SOCIETY, CLASS OF 2016. I’m actually sad that President Trump thinks Climate Change is a hoarse. Climate change is real and the faster we work towards saving our planet, the better for us all. “A former climate change adviser to Donald Trump has said the US President will pull America out of the landmark Paris agreement and an executive order on the issue could come within “days”. Myron Ebell, who took charge of Mr Trump’s Environmental Protection Agency (EPA) transition team, said the President was determined to undo policies pushed by Barack Obama to restrict greenhouse gas emissions. He said the US would “clearly change its course on climate policy” under the new administration and claimed Mr Trump was “pretty clear that the problem or the crisis has been overblown and overstated”. If the US pulls out, the developing countries would bear the grunt and the deal might end up failing completely. 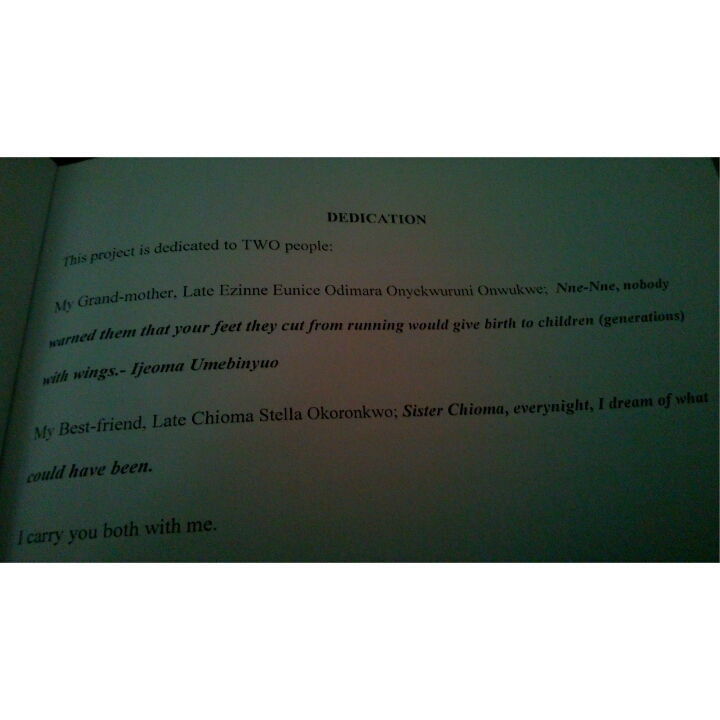 My paternal granny indirectly gave me plenty stories. Everyday, i wish she had the opportunity to go to school. I wish she said NO to patriarchy. One day, I’ll tell her story. I have wings. And because of her I am. My Best Friend Stella Is always in my heart. I miss them. I wish they stayed much longer. On the 12th of December 2015, 195 countries reached an agagreement by gathering in Paris to discuss a possible new global agreement on climate change, aimed at reducing global gas emissions and thus avoiding the threat of dangerous climate change. 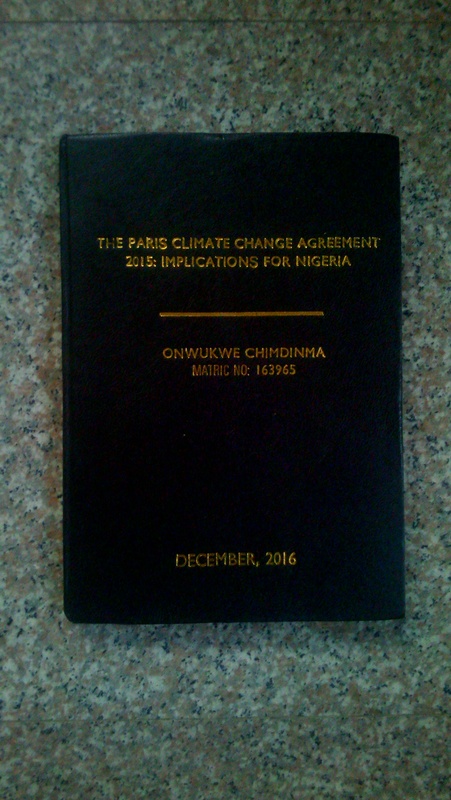 The aim of my work was to examine the 2015 Paris Climate Change Agreement and its implication for Nigeria. The work also disussed key elements of the agreement, the legal status of the agreement and the structure of the agreement. The implications for the different sectors in Nigeria were critically discussed and recommendations were given. Climate change is one of the environmental challenges of the 21st century. And so there is need for legal obligations to further ensure compliance of the Paris Climate Change Agreement. In conclusion, the future of climate change and the aim of the Paris Climate Change Agreement will all depend upon the legal approach taken by the Nigerian government. Having stricter measures and taking a legal approach while following the recommendations will reduce the impacts of climate change in Nigeria. I wonder what the future holds for us. The burden is on the government to prioritize on investments that will make good use of the Paris Agreement Framework. Example, creating awareness on the use of solar panels. Thank you. Humans contribute a lot to climate change and few are gradually recognizing and realizing that. YOU GO GIRL! Here for this. Thank you so much Immaculata….